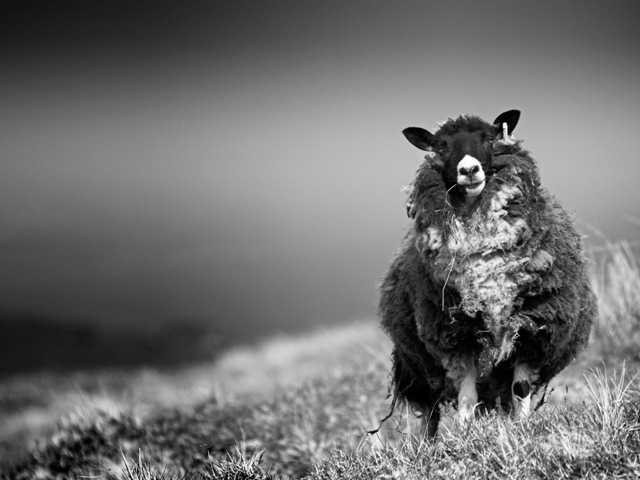 Dascha the Shetland Sheep, photograph (C) Mark Sinclair 2009. The popularity of the Shetland Sheep and its fleece increased in the earlier part of the twentieth century, when Fair Isle and knitwear reached fashionable heights. By 1927 standards had been agreed and the Shetland Flock Book Society was established, which also created the Breed Standard. The breed was for a time listed on the Rare Breed Survival Trust’s lists; as a Category 3 (Vulnerable) in 1977, then Category 5 (Minority) by 1985/1990s. The breed was removed from the list in 2002. Staple length can vary from 2-4.5 inches up to 10. Diameter of the fiber tends to fall between approximately 20-30 microns, although it can be both finer and coarser depending on the quality of the fleece. The fibre should spin up relatively smoothly. According to the available resources, there are eleven ‘official’ Shetland sheep colours: Black, Shaela, Emsket, Gray, Light Gray, White, Musket, Mioget, Fawn, Moorit and Dark Brown[x]. These also have their own subtle variations – Shaela, for instance, can be applied to different shades depending on the Isle of origin. The following table lists these colours, with their descriptors and the equivalent colours in fibre and yarn from the two major Shetland wool suppliers in the UK – Jamieson & Smith and Jamieson’s of Shetland. [xi] These equivalents are based on my own observations and on substitutions used on Ravelry for projects utilising the natural Shetland shades. These are therefore subject to my own biases concerning colour perception; others may view these colours very differently. The main problem stems back a few years to government legislation. It was thought at that point that certain genotypes were more likely to get scrapie – a sort of sheep brain disease that they thought might be able to pass to humans. So they gave farmers and crofters money to cull sheep with that genotype. At the same time, vast quantities of extra paperwork were put in place. Now there has never been a case of scrapie in Shetland the place or Shetland the breed. But the extra hassle meant that quite a few people who had been keeping 20 or 30 sheep decided at that point to take the money and give up with their sheep. It was only at the end of the year, when the fleece started to arrive with Oliver, that he realised what was happening. It turned out that a big proportion of the coloured fleece was kept by these folk with small herds. The folk involved didn’t realise they held an important resource – no one knew it at the time. By the time Oliver realised what was happening and got on to the media, it was too late. Those sheep had been culled. I well remember him saying that there was going to be a shortage for coloured fleece. And he was not wrong. Now some people are realising that breeding coloured sheep is worthwhile, and with luck, the price increases will mean that more will be bred. But that will take time. And a good percentage of the gene pool has already been lost in Shetland itself. As Oliver has said many times, thank goodness for the hobby breeders down south – they have kept the colours. [ii] S. Adalsteinsson (2000) 1000 Years of Sheep in Shetland. A later date linked to Norwegian rule of Shetland has also been suggested. [iii] O. Henry (2009) Shetland Sheep – A Brief Description. [iv] The Shetland Sheep Society – History (2012). [v] The technical information is derived from D. Robson & C. Ekarius (2011) The Fleece and Fiber Sourcebook, p.192; The Shetland Sheep Society – Shetland Wool (2012). [vi] S. Adalsteinsson (2000) 1000 Years of Sheep in Shetland. [vii] L.D. Jacobs (2009) Seeking a Kindly Shetland Sheep. [viii] The Joy of Handspinning – Wool (2012). [ix] L.D. Jacobs (2009) Seeking a Kindly Shetland Sheep. [x] See D. Robson & C. Ekarius (2011) The Fleece and Fiber Sourcebook, p.186-187; The Shetland Sheep Society – Colours & Markings (2012). [xi] Derived from D. Robson & C. Ekarius (2011) The Fleece and Fiber Sourcebook, p.186-187; The Shetland Sheep Society – Colours & Markings (2012); Jamieson & Smith Shetland Supreme & Natural Shetland Fibres (2013); Jamieson’s of Shetland Spindrift (2013). [xii] D. Robson & C. Ekarius (2011) The Fleece and Fiber Sourcebook, p.185. [xiii] The Shetland Sheep Society – History (2012). [xiv] Ravelry profile for NorthernLace. For the forum thread (published 2012), see here, particularly pages 6 and 7 of the discussion. The post quoted above is #136 in the thread. [xv] The Shetland Sheep Society – Colours & Markings (2012). Tags: fibre, shetland, spin, spinning | Permalink.